Hugh Laurie stars as Dr. Gregory House in Season Four of this fabulous and popular American drama series. Dr. Gregory House (Golden Globe Winner Hugh Laurie) is a brilliant medical professional who solves the complicated cases other doctors would dismiss.His abrasive humour and acrimonious attitude towards his colleagues and patients often leads to the alienation of himself but adds colourful humour as the complicated medical mysteries unwind. 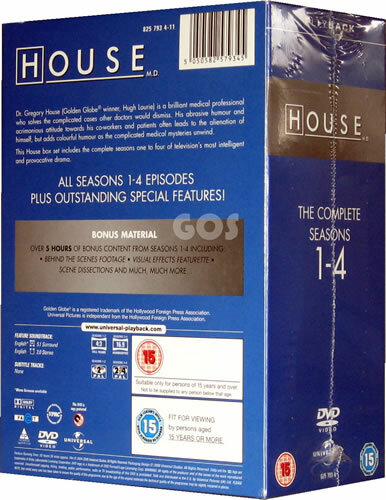 This House box set includes the complete seasons one to four of TV's most intelligent and provocative drama. Prepare for even more baffling, complex and shocking medical mysteries than ever before as every season one to four episode of House is available on this DVD! Reunite with the perplexing and prickly Dr. Gregory House (Hugh Laurie in his two-time Golden Globe winning role) as he tackles impossible cases while putting a new staff of potential team members - including Kal Penn (Harold and Kumar Get The Munchies), Peter Jacobson (The Starter Wife) and Olivia Wilde (The Black Donnellys) - through the medical wringer with his trademark sarcasm and irreverent bedside manner. Get ready for another dose of one of TVs most original dramas.